Begin with the taquitos by heating a teaspoon of oil over medium-high heat in a nonstick skillet, preferably one that’s twelve inches. Add in the beef and cook it, making sure to break it up into pieces with a spoon until the pink is gone. Drain the beef into a colander and put it aside. Grab the beans and mash them into a paste using a potato masher or a fork. Also put it aside once it’s done. Heat a tablespoon of oil over medium heat in the empty skillet until it shimmers and then cook the onion until it’s lightly browned. Stir in the chili powder, jalapeños, cumin, and garlic and cook until it’s fragrant. Follow with stirring the ½ teaspoon of pepper, mashed beans, water, cilantro, tomato sauce, and the ½ teaspoon of salt. Finally, stir in the drained beef until the mixture is thick and starts to sizzle. Use salt and paper for taste. Transfer everything to a bowl and allow it to cool. Use parchment paper to line a rimmed baking sheet. 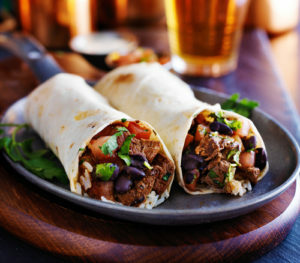 Grab six tortillas and wrap them in a damp towel and then place them on a plate, cover the plate using plastic wrap. Microwave the tortillas until they’re hot and pliable. Using one tortilla at a time, brush the edges of the top half with an egg. Place row of three level tablespoons filling across the lower half of the tortilla. Fold the bottom of the tortilla up and over the filling, then pull back on tortilla to tighten it around the filling. Cover it up with a second damp towel. Repeat the process for the remaining tortillas. Heat the oven to 200 degrees and then heat the remaining one cup of oil in the skillet over medium-high heat to 350 degrees. 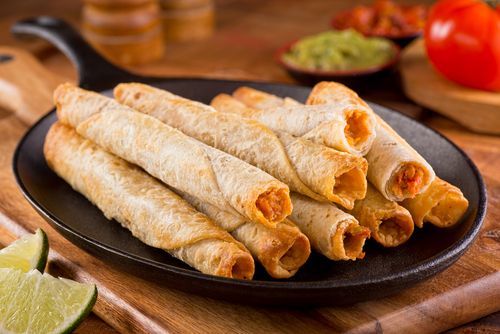 Using tongs, place six taquitos with the seam side down in oil and fry until golden. Flip the taquito over and fry until the second side is golden. Repeat the process for the remaining taquitos. To make the avocado sauce, combine the cilantro, avocados, lime juice, sour cream, and water and mash everything together in a bowl. Use salt and paper for taste. Cover it up with plastic until you’re ready to serve. Begin by placing the chicken breasts in a slow cooker bowl. Mix together the vinegar, barbecue sauce, red pepper flakes, brown sugar, and garlic powder together in a separate bowl. Cook on low and once the chicken is done, drain the juice from the bowl followed by shredding the chicken. For the quesadillas, use butter to lightly brush the tortilla and then place it in a large skillet. Add a sprinkle of cheddar cheese and then follow by adding the barbecue chicken. Use another tortilla to cover and again, brush with butter. 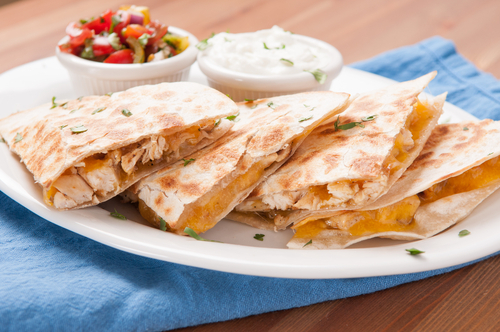 Cook the quesadilla until you notice that the tortilla is lightly brown. Flip it over and repeat the same process for the other side. Once it’s ready, remove it from the skillet and cut it into wedges. Use salsa or sour cream to serve. At Easy Foods, we pride ourselves on making top notch, delicious tortillas, but we’re much more than just great makers of tortillas. 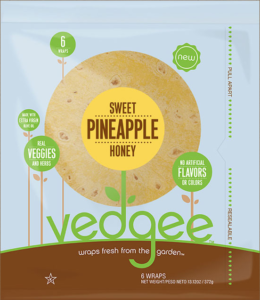 Did you know that we also have another product called Vedgee? With Vedgee, we decided to reinvent the standard garden wrap and we are very proud of what we’ve managed to create. Vedgee consists of fresh garden wraps that are made with pure, extra virgin olive oil and use real vegetables and herbs. There is no cholesterol nor do the Vedgee wraps have any kind of trans fat, artificial colors, or flavors. These wraps are made with 100% vegetable puree and we are so confident in their taste, you can add your own ingredients or savor their fantastic taste with nothing at all, they are indeed that good. We have several different flavors of Vedgee to try: San Marzano Tomato Garlic, Garden Cucumber and Dill, Spicy Chipotle Pepper, Roasted Red Pepper Rosemary, Sweet Pineapple Honey, and Baby Spinach Garlic. You can try these flavors at a number of Winn-Dixie Supermarket locations throughout South Florida. If you’d like to try Vedgee, you can save fifty cents during our month-long promotion beginning September 19th and ending October 10th. Visit our website, find the nearest participating Winn-Dixie and enjoy! If there’s one food that can always taste better each time you eat it, it’s a taco. At its essence, a taco is strictly a tortilla with salsa and filling, and anything else could be considered an imitation. They are best enjoyed hot for the maximum taste. The heart and soul of the taco is the tortilla, a taco with a terrible tortilla simply won’t have that much desired great taste. Flour tortillas are a better option than corn tortillas as they are sturdier, allowing you to prepare larger, messier, and more fulfilling tacos. Corn tortillas are still a fine choice as they do provide an even better taste and fragrance to each bite of the taco, so you may need to decide which option works best for you. As for taco fillings, don’t limit yourself. Vegetable tacos are a great option using ingredients like mushrooms, zucchini, kale, potatoes, or refried black beans as a few examples. Griddled steak tacos are another option, you can use braised beef shoulder if you want to. Do you like seafood? Try a grilled fish taco. Salsa is an absolute must as it separates a taco from being just a wrap. You can try something like tomatillo, but if you prefer to stick to convention, you can’t go wrong with guacamole. Millennials may not have a lot of money, but they sure do love to eat burritos. 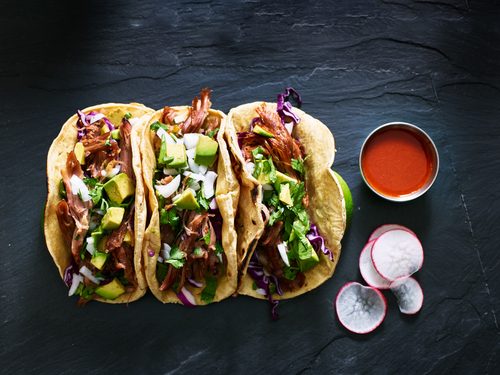 A survey by a fast food chain recently found that millennials cannot go a week without enjoying those tasty giant tortillas packed with a variety of delicious meat, veggies, and cheese. This doesn’t mean it’s just one burrito a week either; just over seventy percent of respondents said they eat at least two or three burritos per week. If we add up the numbers, that means they’re consuming about eight to twelve burritos every month, or a whopping 72 to 144 burritos a year! What’s more, over forty percent of respondents said that if calories or being judged were no object, they would eat more than one a day. Somewhat surprisingly, guacamole is not necessarily the top preferred filling among millennials, with most respondents saying they prefer sour cream. Queso, which is typically used for dipping, also emerged as a popular choice. The love for burritos among millennials isn’t all that surprising. A man in San Francisco went as far as to set up an engagement photo shoot with his soulmate which, as you might guess, was indeed a burrito.